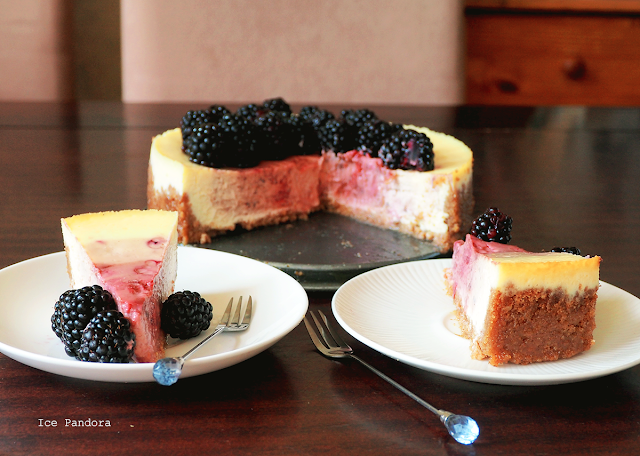 Today a lovely berry-fantastic cheesecake recipe of mine but not just berry flavored cheesecake. It's ombré! I love cheesecake and I will always and forever say yes to cheesecake. 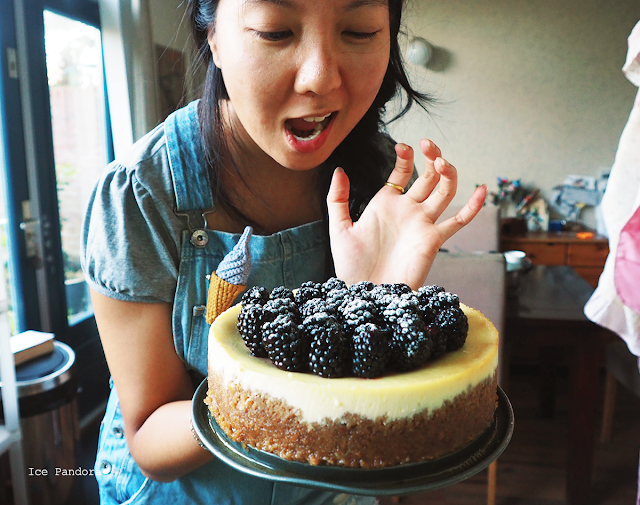 Whether it's New York cheesecake, London Cheesecake, Japanese cheesecake, baked or unbaked and this ombré version is of course a yes for me and I hope it will be for you too. Enjoy! 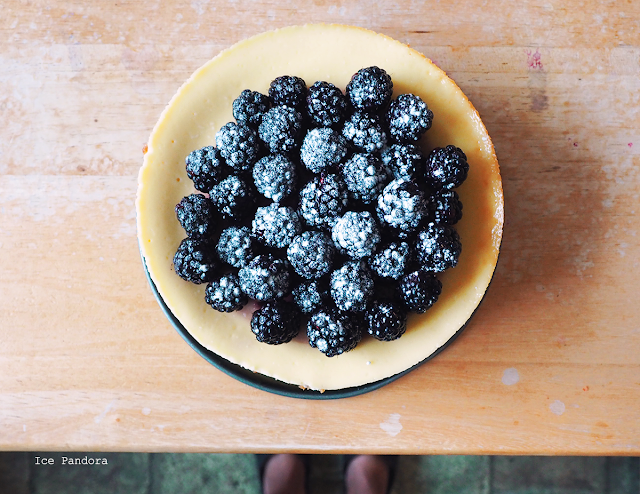 Vandaag een heerlijke cheesecake recept in de smaken bosvruchten en in ombré effect! Ik hou ontzettend veel van cheesecake en ik zal altijd "ja" zeggen tegen cheesecake. 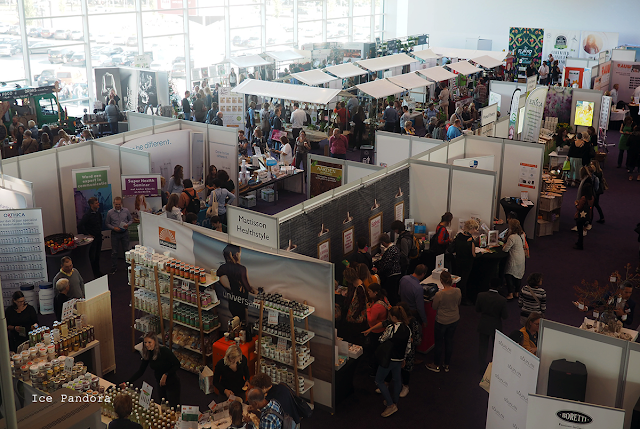 Of het gaat om New York cheesecake, Londense cheesecake, Japanse cheesecake, gebakken of ongebakken en deze ombré-versie van vandaag zeg ik natuurlijk "ja" tegen. Hopelijk jij ook. Geniet en eet smakelijk! So I`ve decided to make 3 stages of colors for the ombré effect going from light, dark, darkest. 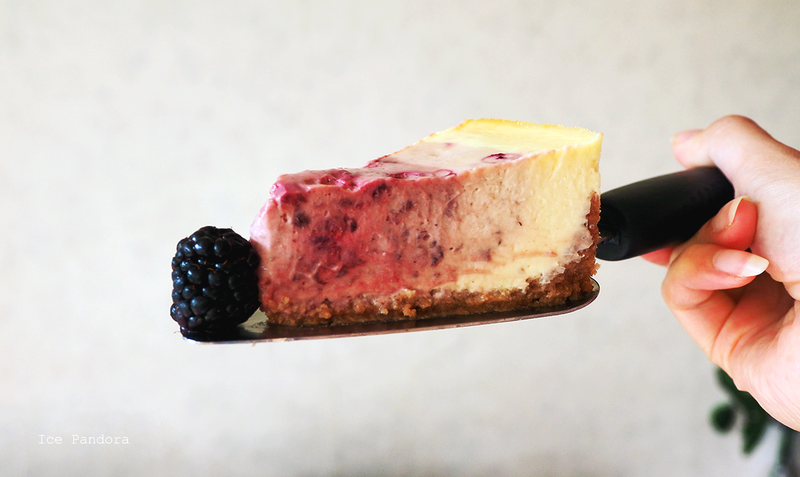 For this all you need is 2 color differences from the berry compote, the lightest is actually your cheesecake base. 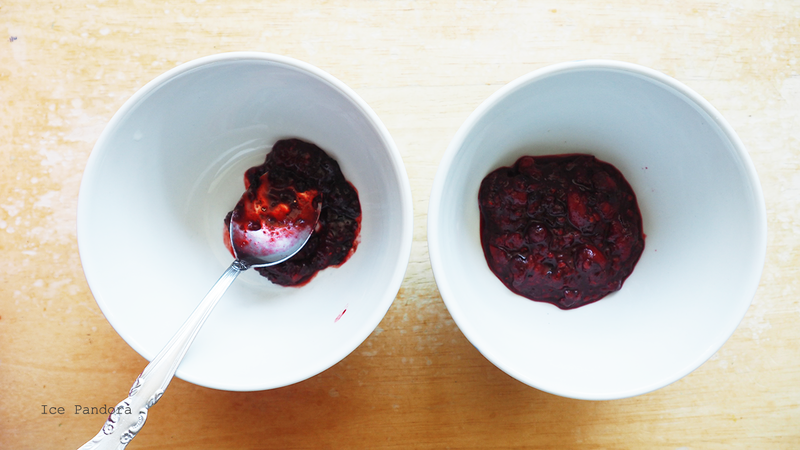 To create the 2 color differences I have scooped up around 30% of the berry compote into one bowl, the second darkest and the rest which is the leftover 70% the darkest color in another bowl. If you want you can create a bigger color differences by doing 20% to 80%. Have fun with it! 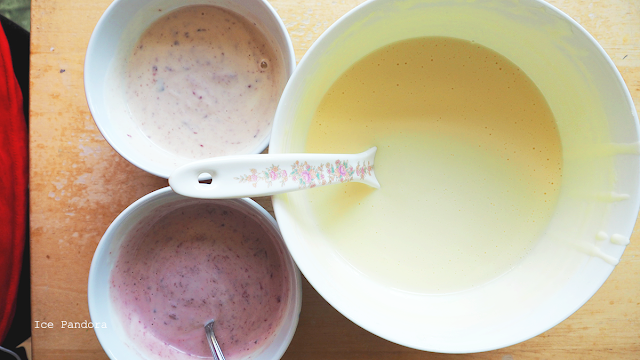 Grab a ladle and scoop about 1,5 cheesecake batter and drop it in both bowls. I`m a spoon-batter-licker (ew, but no shame) and the ones with the berry compote taste so much like my morning yoghurt bowl with blueberries! 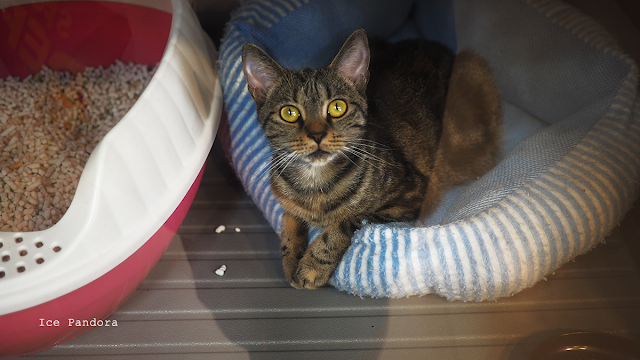 Look at this beauty I was so happy to see this outcome! 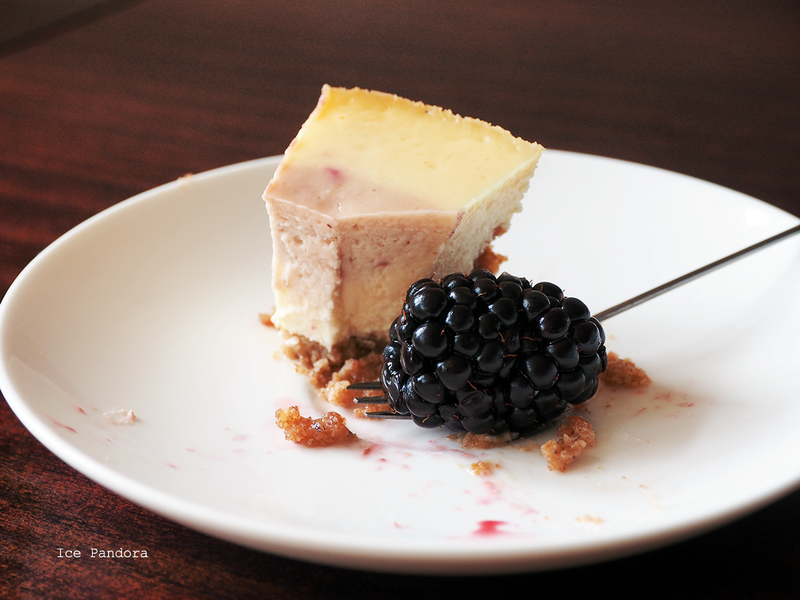 With cheesecakes it is better to wait (overnight even) and let it rest in the fridge for a couple of hours before cutting it. It will firm up much nicer and still being moist and creamy. It is worth the wait trust me! 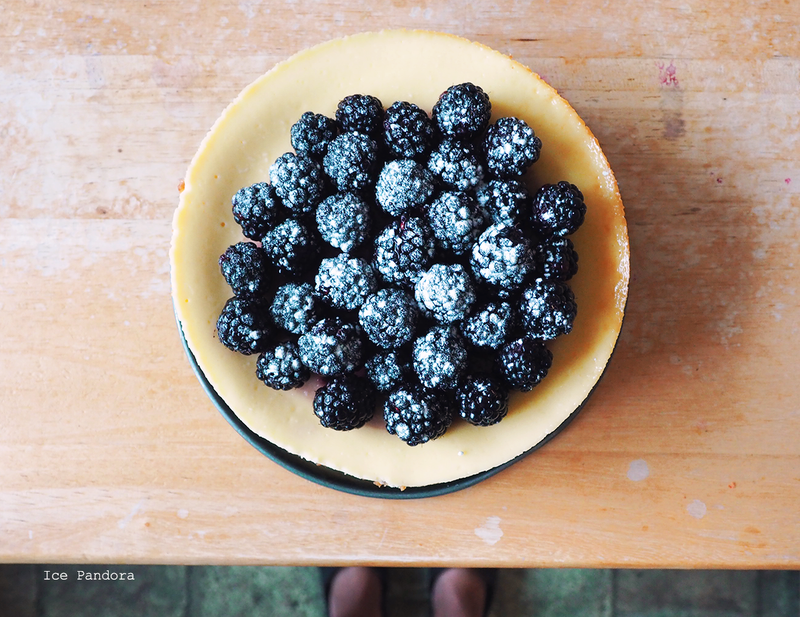 Not your average berry cheesecake but! An ombré on the hideout, to surprise and to wow all cheesecakelovers. 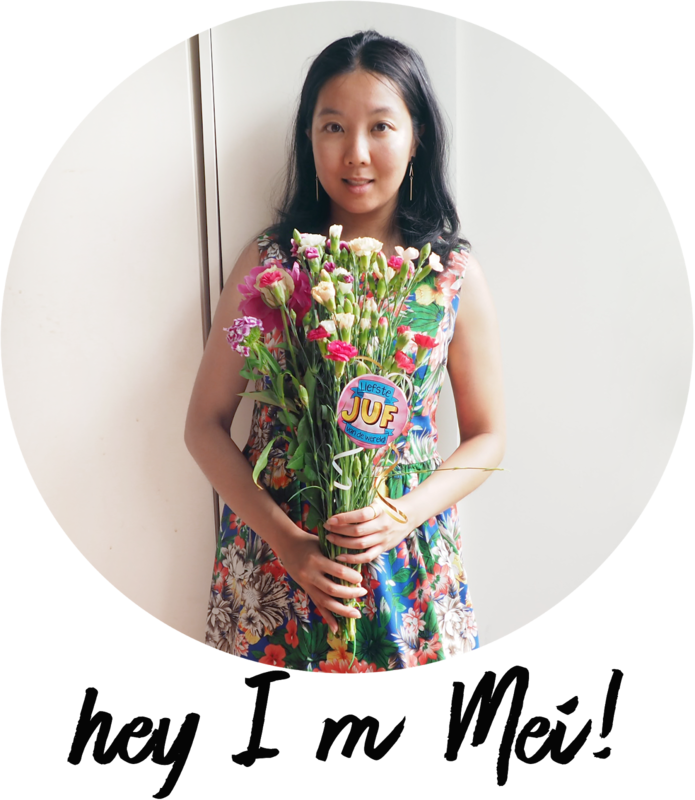 I wanted to eat whole cakes just by myself. Or atleast to have more slices because I was usually limited to just one slice. Now that I`m an adult I can 1. have more slices. Yay! 2. bake whenever I want and 3. share it! 1. 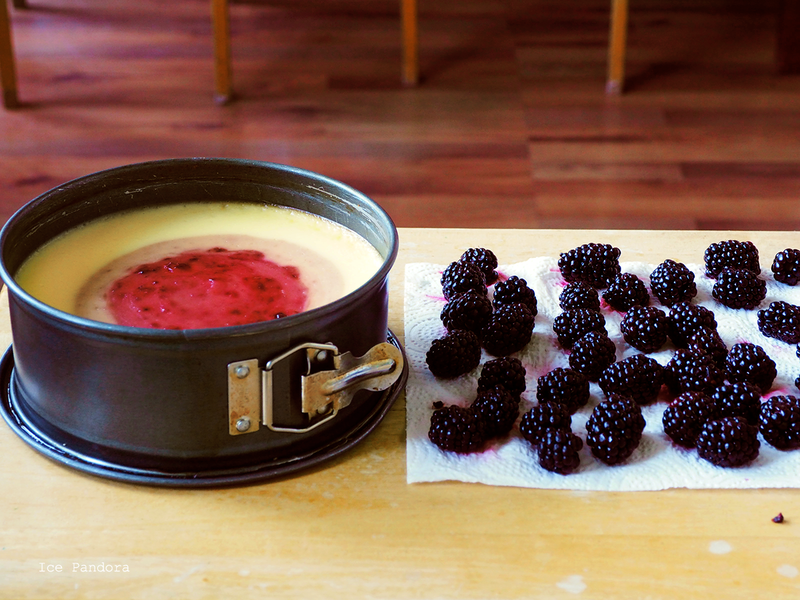 Place the frozen forest fruit along with the sugar in a sauce pan and bring them to a boil on medium heat. Stir every now and then until the sugar has melted away and the fruit mixture is starting to bubble up. 2. Add the water and cook for another 1-2 min until it looks jammy. Don`t overcook it! Let it cool and divide the mixture in two bowls with each different portions: in one bowl 30% and in the other 70%. 1. 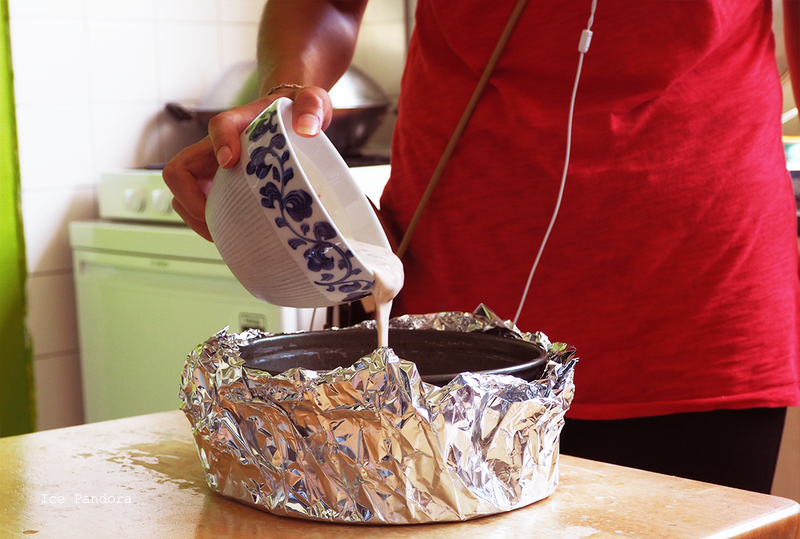 Preheat oven to 180℃ and get a Ø 18cm springform and wrap it around with tin foil. I use double wrapping just in case. Get a large roasting pan or oven dish that is big enough to fit the springform. Boil water in a kettle. 2.Crush the biscuits in a bowl to bits and crumbs and add in the melted butter. Stir and mix well then coat it on the bottom of a springform with a back of a spoon or a cup. Set aside in the fridge. 3. In a large bowl dump the cream cheese and sugar and beat them together with a whisk until smooth and creamy and the sugar has dissolved. 4. Add in the yogurt and mix well until completely incorporated. Then add the cream and mix until it is also dissolved in the batter. 5. Crack both eggs and dump into the batter. Mix gently until the eggs has vanished into the batter. Then drop the maizena and once again mix well. 6. So our cheesecake base is done! 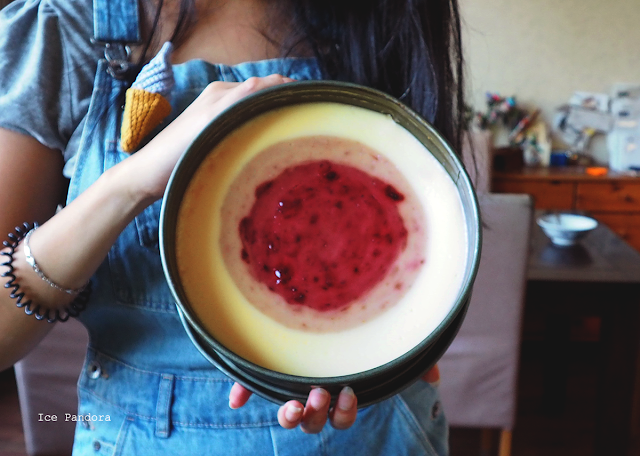 If you want you can bake the cheesecake at this stage but for the ombré effect you do this: grab a ladle and scoop about 1,5 cheesecake base into both bowls with the prepared berry compote. Mix gently. One bowl should look darker (the 70%) than the other bowl (the 30%). 7.Time to ombré! First pour the leftover cheesecake base in the prepared springform. 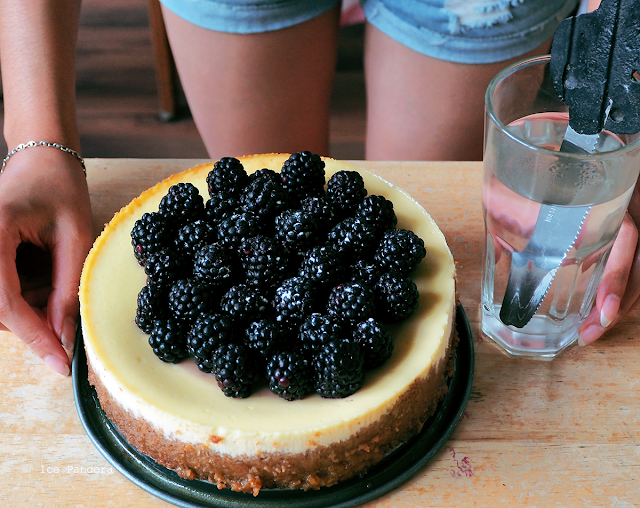 Then pour the 30% berry-cheesecake base in the center. Try to do this perfectly. This should look like a circle spreading out. 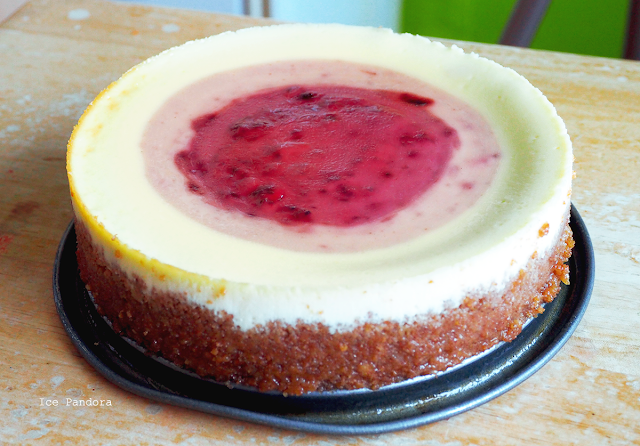 Finally pour the 70% berry-cheesecake base in the center which gives the same effect. Now your cheesecake should have 3 rings with 3 different colors in ombré effect. 8. 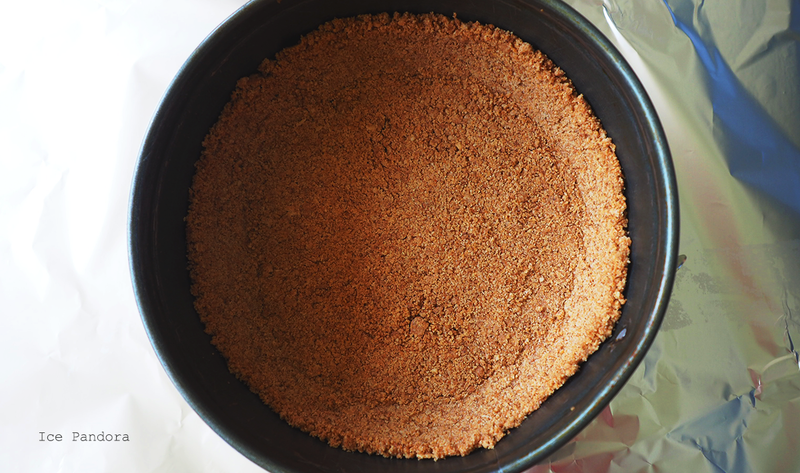 Place the springform carefully in the baking tin and bring it to the preheated oven. Pour the hot water from the kettle into roasting pan halfway around the springform like it is taking a bath. Then bake the cheesecake for 30 min. Reduce to 160℃ and bake for another 25 min. 9. 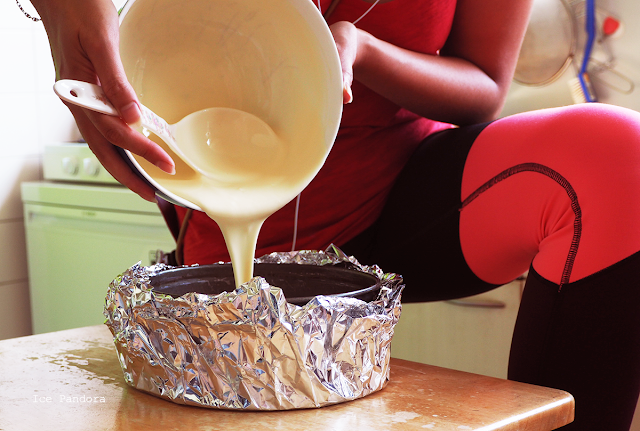 Then leave the cheesecake inside the oven for an hour to slowly cool down. Then let it cool down completely in the fridge for atleast 6 hours or overnight (which makes it even tastier). Decorate it with toppings, serve and enjoy! 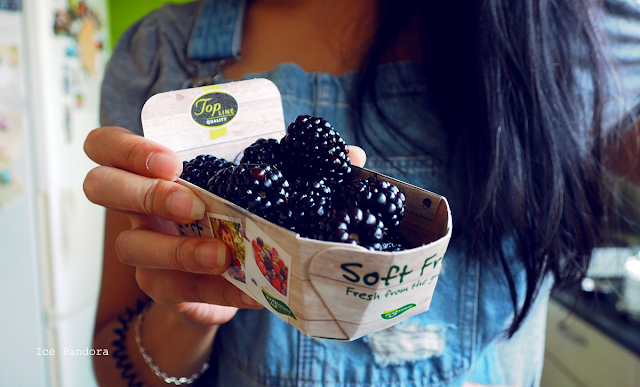 Thank yooou :D haha yeah, that's the idea of the blackberries on top ^__^ to surprise people! This is such a pretty desert! I bet it was so good. I love berry flavored treats.